Bricks 4 Kidz offers various themes of holiday camps to fill your children’s holiday time with so much fun! Each camp period we will have different set of themes, so make sure to check our holiday camp schedule for current available themes. Follow the journey of Batman! Help him to build his cool weapons and vehicle such as Batman mobile, Batarang, and many more. And oh, don’t forget to build the villains too. Are you ready to save Gotham city? Enjoy an adventurous journey through space! Build the Redstone Rocket to blast through the atmosphere. Travel back in time to build NASA’s Gemini Capsule. Trust your astronaut’s building skills to pilot a spacecraft that will bring you back to Earth safely. We’ll build motorized models that represent spacecraft from your favorite popular space movie. Come experience this stellar journey to a galaxy far away! Be ready to enter Jurassic Bricks Land! Kids will build Brontosaurus, the ferocious Velociraptor, terrifying T-rex, and many more dinosaurs! Minecraft is a game about placing blocks to build anything you can imagine. Experience the world of Minecraft with LEGO® Bricks! Kids will start by crafting their shelters and some of the mobs, critters and tools using LEGO® Bricks. Students will face new challenges each day, building models and crafting key elements from the popular Minecraft game. Light, Cameras, LEGO® action! Use LEGO® bricks to tell YOUR story, complete with music, special effects and all your favorite LEGO® mini-figure characters! In this unique and creative camp, kids will plan, script, stage, shoot, and produce their own mini movie using Stop Motion Animation. Working as a team, students will use LEGO® components to build the set and props, then shoot their movie using a camera. Teams will use movie making software to add special effects, titles, credits and more. When the movie is complete, kids will impress friends and family with a screening party on the last day of camp. Don’t miss you chance to be a movie producer! Create your favorite movie characters with LEGO bricks! Whether it’s the magic of Harry Potter world or the amazing adventure of Emmet in LEGO movie, we’ll build them all and surely has tons of fun! Get ready to fight forces of evil to protect the land of Ninjago. Build your favorite Ninjago characters, masters, golden weapons and learn new Spinjitzu to defeat the enemies! Get ready for an adventure in the world of Pokemon! Build your pokemon such as Pikachu, Dratini, Foongus, Trecko, poke ball and more. Let you be the greatest pokemon master!​ Are you ready to catch them all? Let’s build your own city of LEGO®! Kids will love to see their creations in motion using LEGO® wireless remote controls. Each day, campers will use fascinating and challenging LEGO® components to create dynamic vehicles, inventions, machines and more. As they enjoy the fun of building, campers will understand the basic working principles of many ingenious devices that are part of our everyday lives. Campers will also learn how to magnify, diminish and redirect force to move objects at different speeds and in different directions. This camp is loads of fun and learning for budding builders. Kids will build models using LEGO mindstorms kit and learn the basic programming for the robot. They will be challenged to solve problems and command the robots to the a certain task. This camp is very suitable for bigger kids who love challenges! Follow the journey of famous Superheroes! Build cool superhero models with LEGO® bricks from Batman, Superman, Ironman, Spiderman, and many more! Explore all thecaped crusaders and discover theirsuper powers. Create a fantasy world and protect it against all the evil arch enemies with custom contraptions made with LEGO® bricks. Are you ready to save the world? Explore the lives and adventure of the living creatures in the sea. Your preschooler will build jellyfish, octopus, crab, sea turtle, fish, and shark and get to build & play with our big pile of colorful DUPLO blocks! Create your own DUPLO® Circus Parade! Pre-schoolers will build their own circus crews from the mighty Lion, gigantic Elephant, Clowns and more! Fly, fly to the sky! What can you see in the sky above? Airplanes, Birds, Spaceship? We’ll build them all with DUPLO bricks! Save the princess from the pirates! 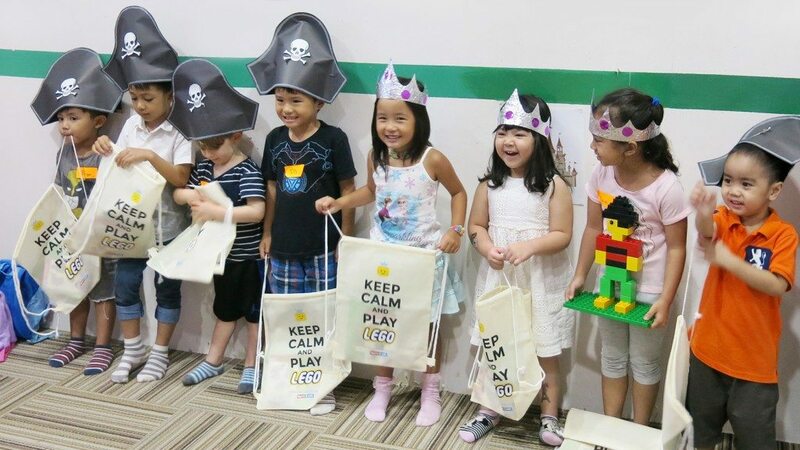 Kids will bring into being their own fairy tale of Pirates and Princess and build them all with Duplo bricks. Sing along while we build and play with LEGO bricks! Creating iconic characters from Sesame Street such as Elmo, Cookie Monsters, Big Bird and more, will surely bring a smile to your preschoolers face. Reinforce essential preschool skills with a fun, new approach based on the time-tested popularity of LEGO® DUPLO® bricks! Introduce your preschoolers to the fun of learning, building and playing the Bricks 4 Kidz® way. In the jungle, the mighty jungle, the Lion sleeps tonight… Let your preschooler enjoy the trip to the jungle and get to know more about animals and nature in the jungle! And watch your preschooler eyes brighten up when they see the colorful DUPLO blocks. Let them have fun while developing essential early childhood skills.